Since Rickie Fowler signed with Puma Golf there's been some very notable combinations of his Puma Attire, like the ever popular smurf look. My first intro to Puma clothes was both exciting, new and revealing. 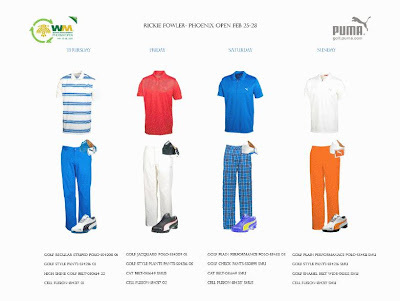 This week for Rickie his Puma attire looks great for those that like style, color and a nice combination of technology . This week Fowler is playing at the Waste Management Phoenix Open and opening with a 65 bods well for playing this weekend (maybe he should of been one of my fantasy picks). It also looks like he got a replacement for his driver than he ran over as well. His numbers from round one don't lie. Here's what Fowler will be wearing this week. What do you think? The Cell Fusion shoes look amazing (white,black and blue my favorite) and it looks like Puma has improved on their Smart Quill technology from last year. Saturday's look definitely reminds me of the Poulter Tartan from Ian Poulter and Sunday is of course all Rickie with the flashy Oklahoma State-orange. So would you wear any of these combinations? Great outfits and very good, but strange video. this is good blog. thanks! share for us!